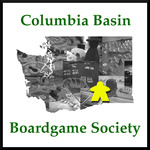 On All Hallow's Eve Eve Eve Eve Eve Eve Eve, 2013, the reanimated corpses of sixteen gamers shambled in to the Official CBBS Gaming Crypt, played some games, and ate some brains. The gaming dead included Tim, Jerry, New Eric, Nyck, Andy, Caleb, Scott, Counterclockwise Scott, Eric Classic, Tom, Alan, Cymi, Shawn, Eryn, Kory, and some new player called Lynette. 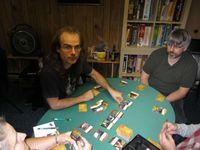 In a slight break of protocol, we began with Ricochet Robots a full five minutes before the official start of Game Night. Somebody stop us! We're crazy! We're not the ones on trial here! Anyway, here are two sample puzzles to fatten up those delicious brains of yours. 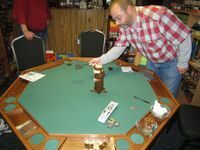 Tim, Jerry, New Eric, Nyck, Andy, Caleb, Scott, and Counterclockwise Scott all earned at least one chip. Brains! Because it was ostensibly a Very Special Halloween Episode of Game Night, we broke out Metro. Because nothing is scarier than building French transportation infrastructure. Also, it was a quick game that would play up to six, in case some stragglers showed up either just in time or just too late to play. Tim, Counterclockwise Scott, Jerry, New Eric, and Nyck all made the deadline. 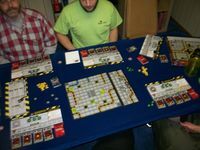 Metro is a perfectly pleasant super filler, with some decisions to be made but without a lot of rules-heavy sturm und drang. 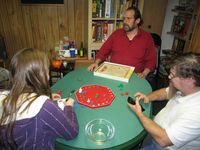 Tim spent most the game drawing tiles that mostly matched the tile he was dealt to begin the game; almost none of them moved his trains towards the center, and he wasted a couple early turns playing dead all-reverse tiles while trying to find something (anything) that might slightly improve his position. By contrast, Counterclockwise Scott and New Eric both managed to wrangle long, twisty paths for at least one of their trains. 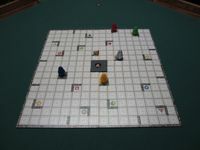 That meant the other players had to spend some effort making sure they didn't connect to the center, or connected early enough that it would be merely a lot of points, rather than an obscene amount of points. The final few plays in this game are kind of odd, as you often can't help yourself and have to decide which of your opponents to help. 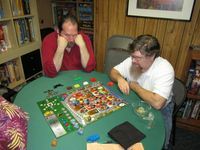 In that regard, Tim's very slow-developing network was a benefit, as he was behind the leaders but with extra trains to play as the board closed up, so it was more likely people would choose to extend one of his lines than those belonging to Counterclockwise Scott or New Eric. Nevertheless, Counterclockwise Scott had at least two lines twisty enough to earn 51 points for the victory. New Eric finished with 48 (almost half of them on one line), while Tim managed to patch together 46 points for third. Jerry ended up with 45 and Nyck scored 21. 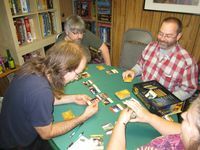 Meanwhile, on Table Two, Andy, Lynette, Caleb, and Scott played a confusingly annotated game of (I think) The Lord of the Rings: The Fellowship of the Ring Deck-Building Game. Andy was Aragorn, Lynette played Gandalf, Caleb became Boromir, and Scott was Gimli. And a fine fellowship they made, too, as they played on Impossible Mode. The scoresheet notes that there was "Crazy Questing" and "22/15". Also, it appears that Gimli was hit by an Ambush a third of the way through and had to discard most of his deck, including his high VP cards. Meanwhile, Lynette's Hobbiton and Shard of Narsil combo earned Gandalf lots of artifacts. But! On the final "Enemy", both Aragorn and Gandalf guessed "even" when they should have guessed "odd", and were eliminated from the game - Lynette with 56 VPs and Andy with 25. That left Caleb's Boromir the victor, with 35 VPs, while Scott couldn't recover from his Ambush and ended with 15. 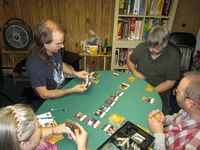 We managed to get an actual horror-themed game to the table next with Finstere Flure, because we needed a seven player game and Table Two was still busy deck building their orcs or whatever. 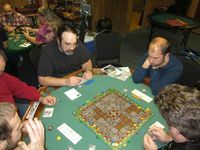 Jerry, Eric Classic, New Eric, Nyck, Tim, Tom, and Counterclockwise Scott fleed from Furunkulus on Table One. 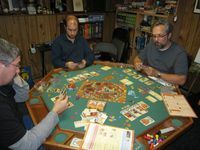 We played with the original rules, in which you win if two of your three fellers escape. Actually, the rules say that the game ends immediately when that happens, which pretty much ensures that turn order will determine the winner, so we played out the round. 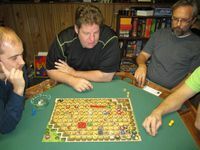 In fact, despite having his 1/6 Policeman get eaten in each of the last four turns of the game, Tim would have been able to get both his remaining cops out on the penultimate turn, except Counterclockwise Scott shoved a block in his way and Eric Classic moved behind it, to keep Tim's 4/3 cop from being able to push it out in front of him. 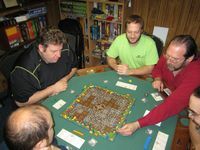 Thus it came to pass that Tim, New Eric, Jerry, and Counterclockwise Scott all got two guys out on the last turn. This reminded me of why we usually played with one of the alternative scoring rules - generally, one point for each guy who gets out on a later turn than you, plus the one point "counting coup" bonus for ending your turn next to Furunkulus. 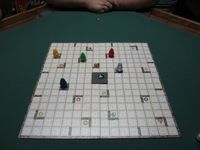 This makes the game go longer - we didn't even make it through all the Tombstone markers once playing by the original rules - and it can lead to a long end game where none of the remaining players have a chance to win, but it probably wouldn't lead to a four-way tie, either. 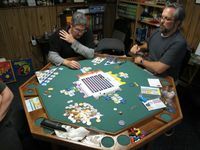 At some apparently imaginary time and place, Alan and Cymi played a few rounds of Finito!. Alan won twice, while Cymi, after much crossing out, appears to have won once. Now the protective covering was on the other pseudopod, as Table Two was done mid-config vis a vis Table One. 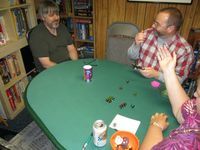 So, Scott, Andy, Lynette, and Caleb played a festive yet bitter game of Martian Dice. As a protest against the International Astronomical Union's reclassification of Pluto as merely a dwarf planet, they decided to play to the historically meaningful total of nine points. Scott and Lynette both achieved this glorious total, while Andy earned but six points and Caleb probably tried the All Tanks strategy and ended up with zero. 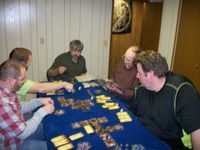 For the reconfig, Tim physically subdued Shawn, Counterclockwise Scott, and Eric Classic, chained them to Table One, and forced them to play Bruges. This was part of a two-fer Stefan Feld order, and I liked this one much more than Rialto. 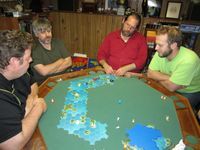 There is still a fair amount of luck, but there are many ways to score and ways to pivot your strategery, and the game moves along pretty well. The scoring bonuses are interesting, as you need to only fulfil the conditions once at some point during the game to earn the four points. So there is a tactical-to-medium-length-strategic element as you try to engineer a unique majority in Canals, Prestige, or People. 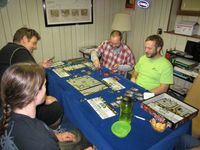 On the first turn, Tim went last and thus was able to make sure he got the Canal bonus by building his first two sections, while Counterclockwise Scott found a bunch of zero cost People early and was able to lock the others out of that bonus all game long. Meanwhile, Shawn got a couple canals down and then couldn't draw a yellow card all game long, so he stalled out. Meanwhile, Tim could only draw very expensive People early on, before he had built the kind of engine that gave him the resources to buy them. So the card luck can be very important, and requires some flexibility if you can't get the cards you need. Anyway, Eric was the first to get all his canals on one side for the big Statue, but Tim was able to finish off his section for the six point bonus. 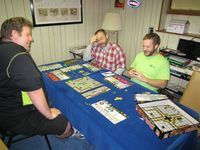 Tim also engineered, with some good fortune from the dice, a situation where Shawn lost all his money from the Yellow Threat Tokens while Tim had enough to buy an extra Prestige step, get a sole majority, and thus earn the Prestige bonus. But counterclockwise Scott, who had a bunch of People and not much else, managed to get a big 12-coin Person down near the end that gave him a ton of points for all his different types of People. Despite the fact that he scored very little in the Canals or on the Prestige track, his People and marginal in-game points (he could force the others to take a Purple Threat token with a Purple card, which cost 3 points once you get three of them) gave him the winning total of 44. Tim finished just behind with 40, while Eric earned 39. Shawn couldn't recover from his canal problems and ended the game with 28. 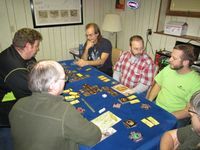 Back in the Lounge, Scott, Andy, Jerry, Tom, Caleb, and Eric Classic played an ambitious and melodic six-player game of Betrayal at House on the Hill. And it only took an hour and a half! Gadzooks! Apparently the Designated Bad Guy for the scenario was Tom- but it was Scott who triggered the Haunt by getting trapped in a Spider Web and injected with its eggs. He was also the only player who seemed motivated to break free of the web, doing five of six points of damage. Jerry had super stats and healed Scott's spider egg infestation and broke down a locked door. 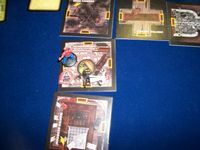 Caleb survived a ten point attack from Tom and escaped the Mansion to earn the victory. Eric Classic also survived. Andy, of course, was killed by the Giant Spider. Meanwhile, on Table Two, Nyck, Alan, and Lynette got in a rare playing for one of the first Fragor games, Hameln. Lynette lost two kids to the piper, while Nyck lost one; perhaps that explains why Alan won, with 10 points. Nyck scored 9 and Lynette finished with five. 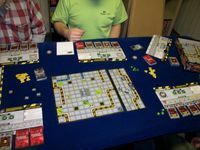 No fewer than four hundred attendees brought their own copies of RoboRally to this Game Night, so it was only right and proper that Andy, Jerry, New Eric, and Kory would play it back in the Lounge. It is not clear why we needed all these photographs of this event, but whatever. Maybe it took so damn long that we couldn't help but take a lot of pictures. Anyway, Eric was the first to the first two targets, but Jerry, who was second to both, surged ahead to get to target 3 first. It was then a race to the final target and victory - won by Jerry. Bleep blap! Andy was the third to get to both Targets one and Two, while Kory trailed behind. Neither made it even to Target three. Blip blomp blonk! Eryn was killed, but the other players survived to see a boring Fame point victory. Lynette was the boring victor, with 24 Fame, while Nyck scored 16 and Alan earned but 6. 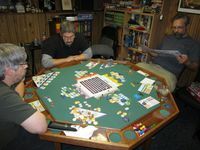 At this point Table One gots to play one of the "hot games" from last year's BGG.con: Suburbia. Tim, Scott, Shawn, and Eric Classic were the (sub)urban planners. 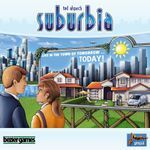 In this game you buy and place tiles representing buildings or lots in your particular suburb; most buildings add population or affect your prestige or income, and many of them (especially later in the game) work with (or against) each other. So you are trying to get synergy between your buildings to build the engine necessary to give you the resources and opportunity to grow your population (which are basically victory points) and try and achieve the four communal and one individual goal dealt at the start of the game. The problem is that the goals are really, really important, which I, at least, found a little frustrating. Obviously, this is a little bit like complaining that while you like moving the horsey around in Chess, you dislike having to trap the opponent's King - I mean, they are called goals for a reason. Still, it seemed like trying to compete in most of the goals were orthogonal to the things I needed to do to get my engine going. That actually can make for an interesting game (i.e. where you have lots of things you need to do, and not enough resources to do them all) - except that it really didn't seem like Scott had that problem - every turn he was buying another Green or Grey building, and he always seemed to have plenty of money (because of his early purchase of a Homeowner's Association). Meanwhile, I was struggling to put together some blue tiles to give me income, and it wasn't until the midgame where I finally had the engine going to the point where I could try and catch Scott on one of the goals. Sadly, both Shawn and Eric were also having trouble keeping up with Scott on all the goals; if we had all competed with him for some of them he might not have been able to keep his lead in them all. As it was, I was able to catch up to (but not pass) him in Greens, and was forced not to play a 2x token to match him there, but he still won Greys and fewest Yellows, and his 81 points gave him an easy victory. 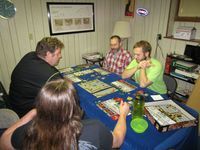 Shawn was pacing Scott in Greens for a while, but couldn't get his fifth; he was, however, the only one to score his individual goal, and that got him to 59 points after trailing behind in population most of the game. Eric Classic scored none of the goals, and it is unclear what his strategy was; he finished with 56 points. Tim finished with 50 points, but, despite all his complaining above, actually had a real shot to be competitive. On the final round of turns he had $15 left, and $18 would have let him buy the final green tile - a Condominium - which would have given him the 15 point "most greens" goal and, indirectly, let him score his 20 point individual goal of "lowest reputation". Nobody else had a negative reputation at that point, so Tim used his $15 to buy some Grey building that put his reputation at -2, which let him score a few more population points. But when Shawn jumped three red zones on his final turn, that dropped him to -3 and cost Tim that goal. So Tim might have scored 30+ points more than his actual total of 50 - if only he had three more dollars on that last turn. That may not have let him catch Scott, but it would at least have put him in the ballpark. So, it is pleasing that there are lots of different ways to get to the end, and it is likely that Scott's victory came mainly because he saw how to compete on the goals more clearly than the rest of us - it is hard to begrudge either a player or the game a victory based on superior play. I do wish the tiles were a little more clear, though - I misread one tile and increased my income for every blue tile when it should have been only for tiles with the "office" symbol. Both the text and the symbol are really really small, and basically impossible to see from across the table, so its easy to get things wrong and even miscalculate the value of the tiles you are buying (or not buying). 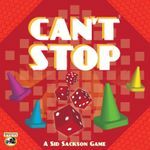 Table Two needed another filler, so Nyck, Eryn, and Alan played Can't Stop. Alan got columns 9 and 11, while Nyck scored 5 and 10. But it was Eryn, who got the 6 and 7 on her final turn to go along with column 12, who claimed the victory. Table One had significantly less time for a filler than they thought they did, as the Lounge Crue came to an unexpected finish. So Tim, Scott, and Nyck played exactly one hand of Love Letter. Nyck was forced to trade the Princess to Tim via the King; Tim then drew a Guard to kick out Nyck, and then a Baron for the victory. For some reason we had six people on Table One at 1:00am, so instead of playing one of our traditional late-nite MMBGs, Tim, Jerry, Scott, Nyck, New Eric, and Andy played Mississippi Queen. Scott got out to an early lead, and then went for broke, screaming down half a dozen post-midpoint tiles at speeds 5 or 6, with only one lady on board. 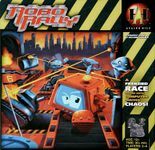 This is dangerous, as not only can you be forced to play a bunch of coal to avoid crashing, but you also lay out a bunch of tiles and give plenty of time for those behind you to find the optimal path. 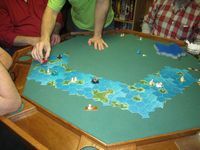 On the other hand, if the tiles are kind and the leader can maintain his speed, it is very difficult to catch up - but, much like real-world bicycle racing, being in second place is often a better position in Mississippi Queen than the lead. Fortunately for Scott, he didn't have any major problems during his run, and near the end of the game he finally found a well-placed lady that didn't require a lot of maneuvering to pick up. However, by that point Tim and Jerry had both their ladies, and were able to come at high speed up the lanes that Scott had forged while he slowed down to let the lady board. Unfortunately for Tim, one tile near the start of the run did not have a clean path through, and he had to spend three precious coal to keep his pace. That meant that when he finally got back on the same tile as Scott, he didn't have the coal to maneuver around him. The penultimate tile only had one path through anyway, and Scott was able to coast in for the victory a turn ahead of Tim. Jerry followed close behind for third, while New Eric came in fourth, Andy fifth, and Nyck finished last. 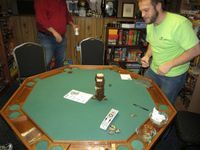 Andy demanded one final game of Toc Toc Woodman before he would vacate the premises, so Tim, JErry, Nyck, and New Eric had no choice but to comply. Tim used the home field advantage to the fullest, at one point getting three pieces of bark on a fortuitous mishit. He finished with +8 for the victory. Jerry scored +4 and Andy earned +3. On the other side of the axe, Nyck collected the final couple cores to end up at -3. But the one big Jenga-style collapse that most games contain was made by New Eric, who finished with -21 points. Hooray! Most of the evite respondees indicated a preference for brains or (oddly) spleen at this week's snack table. There were a few votes for liver amongst the iron deficient, and even a call for lungs. Sadly, our undead procurers got distracted by all these juicy human parts and never returned, so we had to make due with regular crap - including fake Twinkees, Reese Pieces, Beef Jerky (or was that really beef? 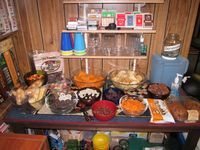 ), Spice Drops, Chocolate Pretzels, Chocolate and Yogurt Raisins, Spicy Sweet Chili Doritos, Mild Duds, Sugar Free Chocolate Enrobed Wafer Cookies, Various Baked Kettle Chips, Zingz, Low-Fat Fig Newmans, Peanut Butter and Chocolate and Cinnamon Almonds, and Pumpkin Chocolate Chip Cookies. 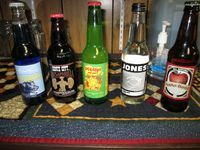 Disappointingly, there was no actual blood to drink, either.